Part of any good funeral is black and white portraits of the deceased, so when Mitsubishi put out "new" photos of the 2015 Lancer Evolution X today, we should've known. While the Evo will live on for one more year here in the U.S., after that, Mitsu is calling it quits on the turbocharged, all-wheel-drive sedan after the 2015 model year. While the Mitsubishi Lancer Evolution has been discontinued in many markets, the United States is committed to producing and marketing the Lancer Evolution through the 2015 model year. 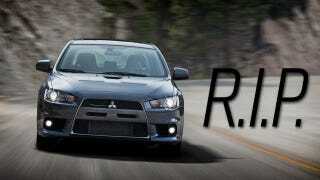 Production of the 2015 model year Lancer Evolution is scheduled to begin in July 2014. Mitsubishi Motors does not have any plans to design a successor with the current concept such as a high-performance four-wheel-drive gasoline-powered sedan. Mitsubishi Motors will explore the possibilities of high-performance models that incorporate electric vehicle technology. Moving forward, the technology honed in the Lancer evolution model will continue to be advanced and proactively incorporated into future models. So, yeah, it's dying. Which isn't a surprise, but brings up a question: What kind of wake should we throw for the Evo?